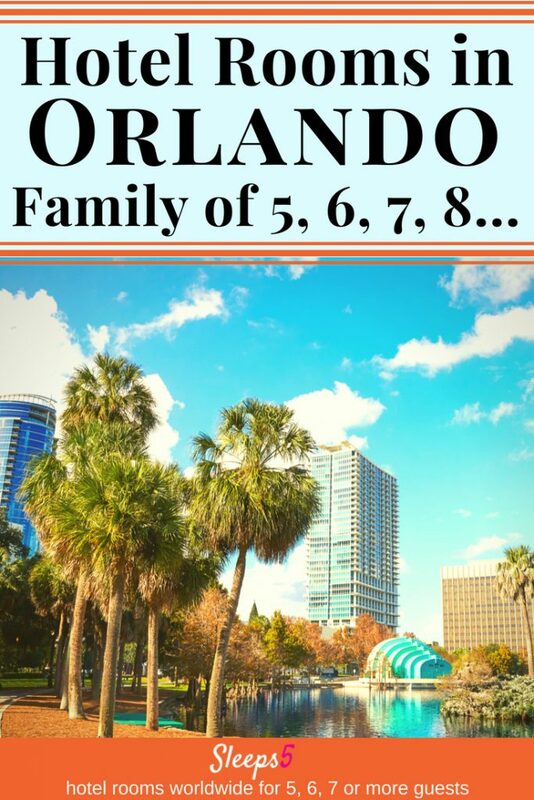 Listed below are family hotels in Orlando, Florida that accommodate 5, 6, 7, 8, or even up to 10 guests in one family room. Included are Disney World accommodations for large families, such as hotels and resorts that sleep 5 or 6, and villas that sleep up to 7 or 8. Others are not Disney properties but are family hotels near Disney World. The list is in alphabetical order (scroll down). The interactive Google map below shows the location of each hotel. The price or rate range of the kid-friendly accommodations is indicated by the “$” symbol. Please see the $-symbol key in the sidebar. Click on the hotel name for more details including contact information. We have included large hotel rooms, suites, condos, and cabins for budgets from affordable to luxury. See the Sleeps5 home page menu to find more United States large family hotel rooms. Included are New York City family hotels, Anaheim (Disneyland) large hotel family rooms, and a wide variety of Washington, D.C. hotel family rooms, plus a blog post and a few family-friendly hotels in New Orleans. Check out this list of 25 websites dedicated to tips on family travel to Disney parks, including Disney World. You’ll find ways to save money visiting Disney. 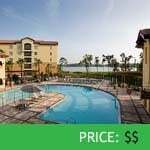 Another Sleeps5 post describes a Yahoo Finance article showing how much it costs to visit Disney World. Orlando has multiple theme parks for family fun, including Sea World, in addition to Disney World. Suggested for listing on your site. 2, 3 and 4 bedroom suites. Between $-$$$, depending on room and time of year. This place is fantastic. The 3 bedroom unit is about 1800 sqr feet large and our family of 5 has room to actually enjoy our vacation! Thank you so much for notifying Sleeps5 about Lighthouse Key Resort and Spa! We will look into adding an entry about it to the Orlando page. It may depend on distance to the theme parks. We always welcome suggestions for adding hotels from guests or owners and managers. We have added an entry for the Lighthouse Key Resort and Spa! We learned it operates as a resort hotel, with full staffing available, and is 4 miles to Disney World. Click on the name above for more details. Thanks again for your suggestion to add this listing. Add Floridays Resort on International Drive to your Orlando list. It is right by Seaworld and is an all suite hotel with full kitchens and 2 and 3 bdrm suites. Reasonable, great pool, hot tub, bar, restaurant, and great location! Thank you for letting us know about Floridays Resort! I’ve added a full listing of the resort, above.